When my friend Sarah contacted me recently inviting me to join her and a couple of others for a train ride in the beautiful countryside of the Southern Natal Midlands, I jumped at the opportunity. Although I had driven along a section of the route once previously, I was nevertheless looking forward to the trip knowing that I could never tire of scenery that is probably among the most picturesque to be viewed anywhere. Beautiful mountains and rolling hills provided a breathtaking backdrop for the bright morning sunshine, uplifting my spirits with each passing second. The small farming community of Creighton was our destination and although the 135km drive from Pietermaritzburg was undoubtedly scenic – it was by no means plain sailing. The narrow winding roads with their tight bends and steep gradients proved somewhat of a challenge requiring a good degree of concentration on my part. Potholes, too, were an ever present problem and one would be advised to be extra vigilant at all times when travelling along this route. After passing through Richmond, we entered Ixopo and proceeded along the Donnybrook / Bulwer road before making our way to Creighton train station –the venue for our trip. 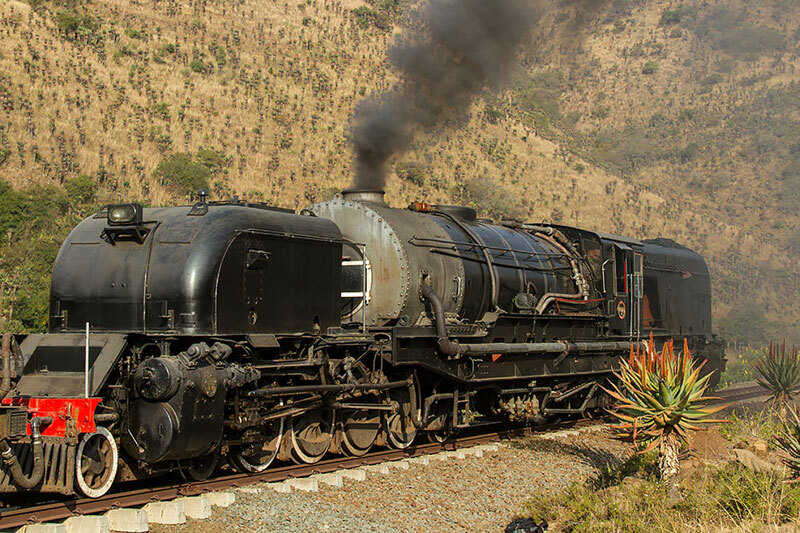 The Eshayamoya is a superbly restored locomotive that was originally built in 1939 and supplied to South Africa by Germany just before the outbreak of World War Two. It certainly looked like many of the trains I had seen in newsreels of that era, a hulking, seemingly indestructible steam-powered iron monster that commanded respect from both friend and foe alike. Soon we were being summoned to the platform to board the behemoth and take our seats on one of its many carriages. With a minimum of fuss we did just that and so began an unforgettable journey – the likes of which I had never before experienced. Travelling onboard a machine from a bygone era such as the Eshayamoya is quite an experience in itself, but doing so through an unspoilt part of the African countryside is even more special – especially countryside as beautiful as that found between Creighton station and the nearby village of Riverside. During this time of the year the surrounding hillsides are a spectacular bright orange courtesy of the thousands of aloes which make their home there and to say I was impressed with the spectacle that unfolded before me would be an understatement. Although these hardy plants were apparently not blooming as brightly as they had done in previous years due to unusually low rainfall levels in the area, they still made for an awesome sight and were without a doubt the attraction of the trip. A scheduled stop allowed me to disembark and take a closer look at the aloes which looked even more beautiful against the backdrop of the shimmering Ngogwaan River. I was in my element and savouring every bit of the uplifting atmosphere but my moment of bliss was cut short as the conductor summoned us back to our carriages with what was now becoming a rather familiar cry of “all aboard.” And so we continued on our journey, passing by a number of small settlements characterised by their tiny mud houses and smiling inhabitants, some of whom didn’t seem as though they had a care in the world. During our final stop, at the tiny village of Riverside, there was enough time to witness a most entertaining display of traditional Zulu dancing and to pay a quick visit to the rather spooky and foreboding ruins of the old Riverside hotel. On the return journey I was left to ponder the afternoon’s events and concluded the trip was well worth R180, even if that only secured us a place in the so called ‘cheap seats’. My only criticism of this trip were the onboard snacks which could have been a lot more substantial than chocolate bars and potato chips. Nevertheless, we all had a great time and will no doubt be back next year for what will undoubtedly be another memorable outing. Thanks Jane. It certainly is well worth it. Of that you can be assured.